Foraging theory predicts that mobile predators should target high proﬁtability areas with plentiful resources and minimize time spent moving between these areas. This has led to a focus in recent literature on the identification of "hotspots" important for migratory marine predators, i.e., regions where predators spend disproportionate amounts of time ostensibly due to high prey abundance; and determination of the environmental features characteristic of such areas. We investigated factors predicting foraging success in southern blueﬁn tuna (SBT; Thunnus maccoyii), by integrating telemetry-based feeding and movement data (n = 19 ﬁsh, length to caudal fork [LCF] = 99 ± 3 cm) with environmental data over the scale of their annual oceanic migrations during 1998–2000. 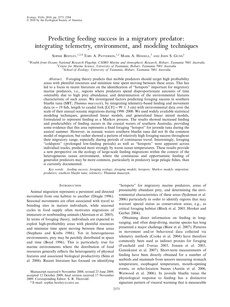 We used widely available statistical modeling techniques, generalized linear models, and generalized linear mixed models, formulated to represent feeding as a Markov process. The results showed increased feeding and predictability of feeding occurs in the coastal waters of southern Australia, providing some evidence that this area represents a ﬁxed foraging "hotspot" for juvenile tuna during the austral summer. However, in oceanic waters southern blueﬁn tuna did not ﬁt the common model of migration, but rather showed a pattern of relatively high foraging success throughout their migratory range, especially during periods of continuous travel. Interestingly, foraging "coldspots" (prolonged low-feeding periods) as well as "hotspots" were apparent across individual tracks, predicted most strongly by warm ocean temperatures. These results provide a new perspective on the ecology of large-scale feeding migrations within the context of the heterogeneous ocean environment, where the continuous and opportunistic feeding of generalist predators may be more common, particularly in predatory large pelagic ﬁshes, than is currently documented.